Is there a better alternative to time 3D? Is time 3D really the best app in Screen Savers category? Will time 3D work good on macOS 10.13.4? 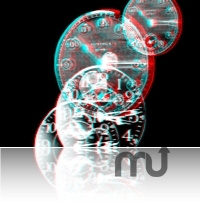 time 3D is an anaglyph (3D), sound-reactive Quartz Composer file. In order to enjoy as a screen saver properly, you will need a pair of anaglyph 3D glasses (type Red/Blue, Red/Cyan). time 3D needs a rating. Be the first to rate this app and get the discussion started!